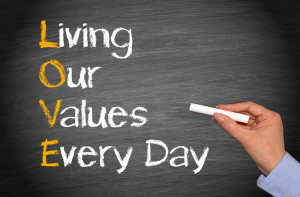 The term ‘values’ is almost as widely used these days as the ‘mindfulness’ word. The global instability we’re experiencing has made values a priority for many of us who never thought much about them before. We didn’t need to think about them. We were riding high. And if we weren’t currently riding high, the promise that we soon would be was enough to keep our attention focused on what we could get, or where we could get to. Since 9/11 we’ve learned that nothing is guaranteed, especially our sense of being separated from the rest of the world’s problems by bodies of water. We’ve learned that what we’ve gotten can be taken from us and that we may not get where we planned to go. I planned to have triple what I have in my retirement fund by this time. The market hasn’t cooperated. So if we can’t rely on stability either at home or abroad, what can we rely on? We can rely on our values—which means we can rely on who we want to be and how we want to show up as human beings on a day to day basis. John Steinbeck (the Pulitzer Prize winning author of Grapes of Wrath) said we’re becomings, not beings. That perspective makes it all the more compelling to live in congruence with our values. But like any idea that becomes popularized, words themselves run the risk of being over used or re-interpreted to the point where they’re just watered down terms that have lost the meaning that originally inspired us. This post focuses on bringing values to life. The trick is to actually apply them to your life in the form of new behaviors. It’s not enough to just identify your values. They need to be actively working for you! I’m not going to take you through identifying your values. You can do a Google search on values and you’ll get endless approaches to determining your top 3 or 5 or 10 values. Do that first. Or, you can simply ask yourself, “On my deathbed, what will I regret not having more fully expressed?” Those are your values. Once you have a few of your most important values identified, here’s what you need to know to make them start working for you. Values are influenced and brought to life by a combination of intention and attention that results in a concrete plan. After you’ve identified a value that you want to more fully express, start with concretizing your intention. In order to pay attention to something over the long haul, you need to set an intention to do that. Because there are so many stimuli in your environment trying to hijack your attention in any given moment, without an intention to do something different, you’ll have the thought that you should do better, and then not think of it again until the next time you have the same thought. So step one in applying and expressing a value, rather than just talking about it, is to set an intention. And I can’t stress this enough — write it down. Here’s an example of my intention to more fully express honesty, one of my values: ‘My intention is to notice when I exaggerate while telling a story’. I was notorious for making big, bold statements, not realizing that sometimes people took me seriously and didn’t know I was exaggerating for effect (or for my own entertainment). So I set an intention to notice when I exaggerated, and then do something different. Step two is to decide on your focus of attention. William James, the brilliant religious and spiritual philosopher, suggested that the act of paying attention is what sets geniuses apart from ordinary people. You can set intentions till the cows come home, but if you’re not paying attention, and if your attention isn’t intelligently and purposefully directed, you likely won’t get the outcomes you’re hoping for. Finally, step three is to create a plan for how to change your behavior. The plan will involve catching yourself engaging in the old behavior, interrupting it, and replacing it with a new one. If your value is to be a loving and healthy role model as a parent, your plan could be as simple as setting the intention to stop once every hour to ask yourself, is what I’m doing right now consistent with who I want to be as a parent and healthy role model? If you’re uncomfortable with the answer, create a plan to change that. You could replace yelling when you want your kids to cooperate with inserting the simple pause/breathe/notice your story/soften your body behavior that I’ve written about before. Practice, over and over until you’ve literally created a new neural pathway, reinforcing the new behavior until it becomes second nature to behave in the new way. You will forget! That’s OK. The light at the end of the tunnel is that every time you remember, the easier it will get, and the more you’ll be bringing your values to life. After you’ve identified a value, set a concrete intention to notice when you’re not living up to it, and write down your intention to change. Include the object of your intention, i.e. what you want to catch yourself doing that will tell you you’re not living out of that value. Create a simple, measurable and achievable plan to replace the old behavior with a new one more in line with your value. I still exaggerate occasionally, but I’m much more purposeful about it, whereas before I was a habitual exaggerator. This is the crucial take-away—even if the world isn’t as stable as you’d like it to be, you can bring stability into your life from the inside out. Just like freedom, stability is an inside job, and you’re the boss. Thanks for staying with me to the end. I’d love to hear if this was helpful – please add your comment below, send an email, or share it. Thanks Robyn. This was very helpful. I’m going to give this a try. Especially writing it down. To see it visually may help.. So glad it made sense to you Trisha – and yes, I find that somehow just the act of writing it down makes it stick with me in a way that it doesn’t when I try to carry it around in my head. I think I’ll remember, but I just don’t! Thanks for taking us through the process of living our values, Robyn. I never thought of exaggerating as something to overcome–maybe because I, too, like the grand sweeping gestures and hyperbole! Great post. Thanks Vickie–more and more I’m coming to believe that all my greatest strengths are also at times limitations–the good news is that the reverse also seems to be true lol !